Secretary of the HCMC Party Committee Nguyen Thien Nhan received Mr. Shim Won Hwan, director general of Samsung Complex in the northern province of Bac Ninh, yesterday afternoon. At the meeting in HCMC, they talked about workers’ ability and vocational training for Vietnamese laborers. Mr. Shim said that Samsung now uses 180,000 Vietnamese workers. Of these, 1,500 engineers and experts are working at Samsung Research and Development Center. City party secretary Nguyen Thien Nhan hoped that Samsung will work with local authorities more positively in the upcoming time, proposing the company to open its plant to public one day or one week for Vietnamese students to visit and learn about industrial life and culture. 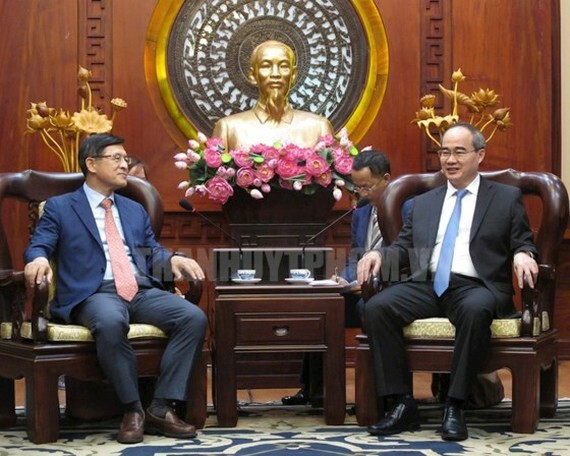 Mr.Nhan acclaimed Samsung Group for encouraging consumption of Vietnamese semi-finished products and committed to facilitating Vietnamese businesses’ ability improvement to meet the group’s requirements.